Image caption Will HSBC keep its headquarters in the UK? 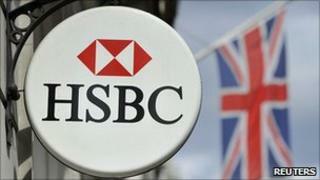 HSBC may move from London if the UK government decides to break up big banks, a senior executive has said. Stuart Gulliver, head of the Canary Wharf-based bank's investment banking division, made the warning at a banking conference. He said he was "genuinely concerned" that the UK's banking commission would recommend splitting up banks. "[That] has significant implications clearly for where we may choose to headquarter our institution." "I want to be crystal clear. Our preference is to be headquartered in the UK," added Mr Gulliver. Mr Gulliver, whose bank did not receive any direct government support during the financial crisis, made his comments in response to an audience question at an industry conference in London. He said it would be "very very regrettable" if the commission came to a decision "that causes the banks that actually didn't take any money from any government anywhere in the world to have to move their headquarters." He also noted that no other country was looking at breaking up banks in response to the 2008 financial crisis. The UK's coalition government set up the independent banking commission in June with a broad remit to consider possible reforms of the banking system. It will report its findings to Business Secretary Vince Cable. His party, the Liberal Democrats, campaigned during the election in favour of splitting up the banks, separating their traditional commercial banking activities from their riskier investment banking business. The commission could also consider other structural reforms, such as breaking up High Street banks to increase competition, or forcing the banks to simplify their international structures to make any future bankruptcies easier. Image caption Mr Gulliver said he was "genuinely concerned"
Many economists and policymakers concluded in the wake of the 2008 collapse of Lehman Brothers that the large international banks had become "too big to fail". If a bank is so big that its collapse would bring down the entire financial system, governments would always be forced to rescue them. The concern is that if banks know that governments will always come to their rescue, they may be encouraged to take on too much risk. HSBC moved its headquarters from Hong Kong to London in 1991 after its acquisition of Midland Bank. It currently occupies one of the largest tower blocks in Canary Wharf.